We were really impressed by the scenery on this back road in Maine. I recall wondering if the overall feeling would come through on the images as we photographed. I believe there are indeed times when our senses pick up things that cannot be picked up by the camera, things like the sound of the wind rustling through the trees, the impact of smells emanating from the various plants and the feeling of enjoying the scene in real time as the light changes. In the past I can recall photographing somewhere and being awestruck at the scene; yet in viewing the resulting images I wondered what I saw there that was worth photographing. In viewing this image, it feels like about half the experience of being there is recorded here -- and it still ain’t bad. The wind was blowing and colorful leaves were falling everywhere. I recall thinking that I wished we had brought along some food so we could have a makeshift picnic. 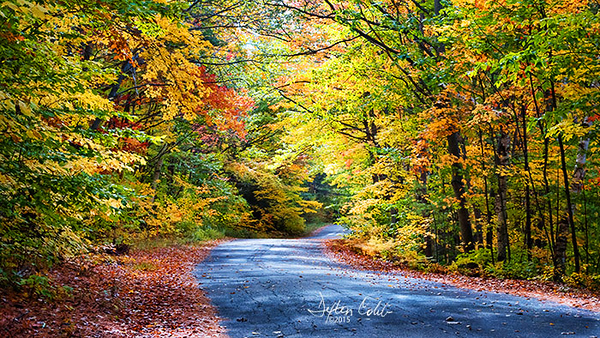 This is a classic New England back road at peak fall color that was truly fun to experience.